Chökyi Wangchuk was born in Drikhung area of Central Tibet and the Ninth Karmapa enthroned him as the Sixth Shamar incarnation. From an early age, he followed and studied with the Ninth Karmapa and received the full transmission of the Kagyu lineage. He became one the most renowned Panditas of the time, in Sutra and Tantra, composing many commentaries. He was the teacher of Desi Tsangpa, who ruled Central Tibet at that time. He rebuilt the monastery in Kampo Neynang. He also traveled extensively to China and Nepal. He taught Buddhism in the original Sanskrit to the king, Laxman Naran Singh, in Nepal and to other devotees. He eventually passed away in the mountains of Helambu, Nepal. 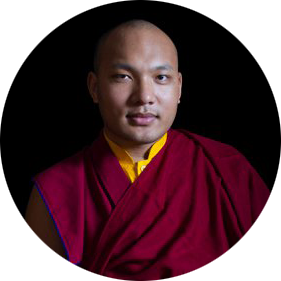 He passed on the lineage teachings to the Tenth Karmapa. He traveled to Kham, in eastern Tibet, and recognized and became the principal teacher of the Tenth Karmapa Chöying Dorje. These details about Chökyi Wangchuk are compiled from Karma Gyaltsen’s book called kam tshang yab sras dang dpal spungs dgon pa, Szechwan edition, p. 135. May this be virtuous!